Nobel laureate, Wole Soyinka, will cut his United States green card and pack out of that country if Republican Party candidate, Donald Trump, wins the American presidential election next week. “The moment they announce his [Trump’s] victory, I will cut my green card myself and start packing up,” Mr. Soyinka said. 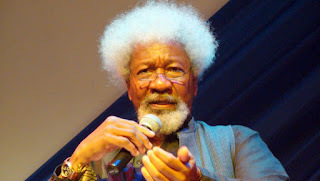 The British Broadcasting Corporation reported on Thursday that Mr. Soyinka spoke at a gathering in Oxford University. Mr. Trump, a businessman, is the challenging a former U.S. Secretary of State, Hillary Clinton, in the election that comes up next Tuesday. Mr. Trump has been known for his blunt take on issues, and he’d repeatedly stated his intention to erect a wall around the U.S.-Mexico border to fend off illegal immigration into his country. Mr. Soyinka said he knew Mr. Trump would waste little time in sending Mexicans and people of colour out of America should he emerge president. The professor said he would not wait for Mr. Trump to make the pronouncement before shredding his green card. “Well, I’m not waiting for that,” Mr. Soyinka said. The green card is a permanent residence permit issued by the United States and its highly sought by Africans.